Shor-Line was named the Kansas Governor’s Exporter of the Year for 2018. 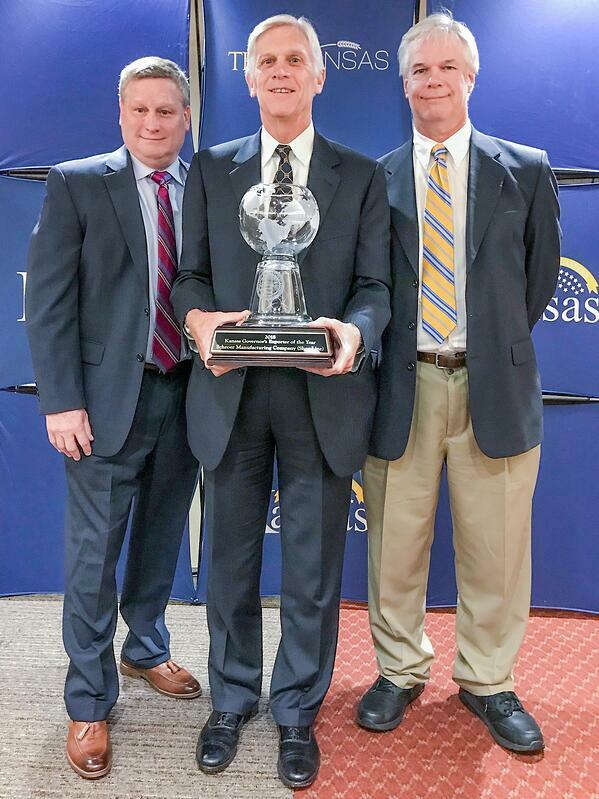 The annual award honors a Kansas company that has exhibited excellence in conducting international trade. “We are thrilled to be named Exporter of the Year. 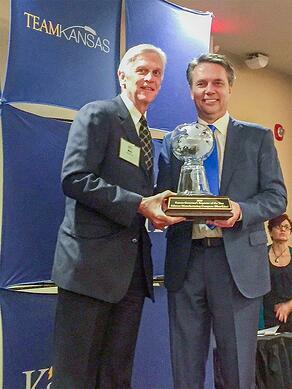 This award is a testament to the hard work of everyone at Shor-Line, both overseas and in the Kansas City office. Our grandfather who founded Shor-Line in 1927 and our parents who guided the business for many years would be proud indeed,” said Richard Donahue, Chairman of the Board. Shor-Line today has an extensive international distributor network and related operations not only in the UK but also in China. Solid market shares exist in Europe, Australia, Canada and Mexico. In Asia, Shor-Line has long serviced customers in Japan, Hong Kong and Taiwan. New export opportunities continue to develop especially in various Central and South American countries. Shor-Line Ownership: (l-r) Joe Schroer, president, Richard Donahue, Chairman of the Board; Jack Donahue, Executive Vice President. As a third generation privately held business, Shor-Line’s management team sees international expansion as a very important part of its business plan. Emphasis will be placed not only visiting our trade partners but also on attending international trade shows to better understand foreign markets and develop new business relationships. As the company moves through its 91st year in business, the future is quite bright especially with the continuing evolution of societal views on animal welfare. With this trend accelerating internationally and enhancing the standards for the treatment and care of pets, demand will only increase for quality companion animal products such as those made by Shor-Line. Shor-Line has made its name in international circles through the dedication of its employees and international partners. With the continued support of these associates, the company is excited to participate in the future growth of the veterinary and animal care businesses internationally. Shor-Line announced that the Prelude LED Surgery Lights are UL/CSA certified, but some ask why it matters. The simple answer is that the lights are certified to Medical Electrical Equipment (Surgical Luminaire) standards…and not all manufacturers are willing to invest in that level of scrutiny. To become certified, the LED lights need to conform to rigorous standards of performance for both human and veterinary standards. Light brightness and color clarity must fall consistently into given specifications, and the lights must meet stringent manufacturing standards and testing. Switching over to LED surgery lights or upgrading your current lights is a big decision. A U.S. Department of Energy task force developed a great report on LED surgery lights that is a must read for anyone moving to LEDs. It will help you evaluate your choices. 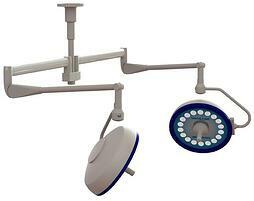 The Prelude LED Surgery Lights have superior features to the halogen lights you have been using during surgery. Uses less wattage to produce equivalent light levels and therefore saves money in the longterm. Emits less heat into the room than halogen lights, which provides more comfort to the patient, surgeon and assistants. Promises greater bulb life and predictable performance in an operating room setting. High illumination. A significant amount of light is required, by standard, for surgery. The Prelude gives you 90,000 LUX at one meter. Shadow reduction. Contour shadows help you distinguish the organs and masses during surgery while contrast shadows are distracting. The ideal light provides a balance, which is one of the more important features of the Prelude. Adjustable positioning. Likely there will be several veterinarians using the light, so the light needs to position easily for the tallest vet and the shortest vet. The Prelude has a 360-degree positioning flexibility with no light head drift. What works for your practice? The Prelude LED Surgery Light can last up to 100,000 hours, which could be the remainder of your practicing life. Shor-Line quality is known for durability, so making our LED light stand the test of time was important. During this time, the Surgery Light will serve many veterinarians and technicians of different heights and working styles. At trade shows, we encourage veterinarians to move the lights in circles and quickly position them. In short, to see if the light can be adjusted to their comfort level. Our surgery arm system is the most flexible in the industry, allowing you to move it 360 degrees. It stays where you put it and does not drift. No matter where you need the light positioned, it will be there. Like many technical improvements, the products become more affordable as high-quality manufacturers develop ways to deliver the quality you need at the price you can afford. The Prelude LED Surgery Lights are performing under the highest medical standards for surgical lighting affordable in the veterinary market. Color sends people messages hundreds of times each day, including the moment they walk up to your facility. Color can make us happy one minute and anxious the next. “People make up their minds within 90 seconds of their initial reactions with either people or products. About 62-90 percent of the assessment is based on colors alone,” reported Satyendra Singh of the University of Winnipeg in her research. How does color choice influence your customers? You actually have two audiences—the pets and their pet parents. In a perfect world, both would like the color choices. For years the book on dogs and cats was that they only saw in black and white. Research has now determined that dogs do see some color. Both humans and dogs have special light catching cells called cones inside their eyes. These cones respond to color. However, dogs only have two types of cones while humans have three. Researchers believe this is why dogs see much like a color-blind person—able to see some color but not the whole spectrum. Jay Neitz at the University of California, Santa Barbara, tested the color vision of dogs and found that they see a spectrum of green, yellow, blue and gray. An article in Psychology Today by Stanley Coren, Ph.D., F.R.S.C., suggests a dog’s vision spectrum is like the chart below. Veterinary Vision, Inc., in San Francisco is a group of veterinary ophthalmologists. The practice’s website shared research on what dogs see. “Behavior tests in dogs suggest that they can distinguish red and blue colors but often confuse green and red,” an article on the website reports. So, if pet parents wonder why their dog can’t find the red ball in the green lawn, color might be the issue. A blue ball would be better. Singh predicted that the blue would dominate design the first decade of the 21st century with complementary colors gray, taupe, aqua and pale brown providing accents. Fortunately for the companion animal world, these trends fall nicely in line with what animals prefer as well. An American Express Open Forum article shared current research on what messages color sends about your business. 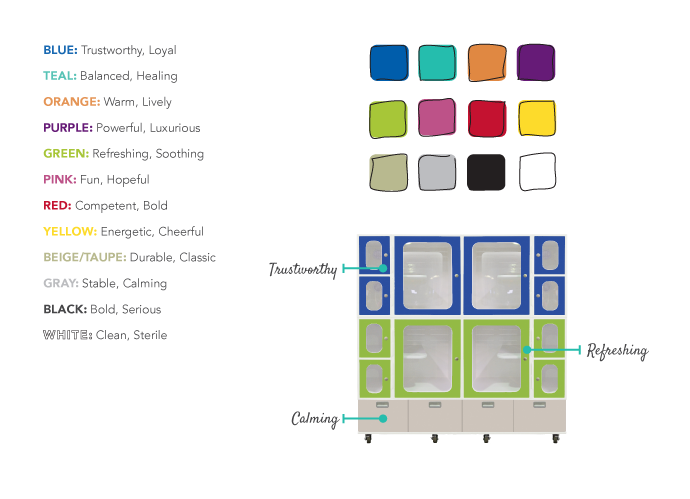 This Shor-Line cat condo shows how you can send several messages with pops of color. The clean white interior shows you value cleanliness. The pop of blue and green are trustworthy and down to earth. The gray anchors the condo with a stable, calming presence. You don’t have to bathe your business in color to create an emotional connection. In an article in Entrepreneur magazine, Jane Porter explained that subtle uses of color can evoke memories. In dog daycare and boarding facilities, a beach theme is common because pet owners want to think of their pet having a vacation just like they are having. Blues, greens, tans and yellow can trigger visions of water, palm trees, sand and sunshine. Let color be your friend in creating a welcoming atmosphere for people and pets. Even small touches add fun. At Shor-Line, we have added the Blue-Line products with a color accent around our durable stainless steel tables. Enjoy using color in your business, and send us some pictures about your people- and pet-friendly facility designs! Ready for the Summer Boarding Rush? An increasing number of Americans are planning more leisure travel in 2014 than 2013, according to an American Express Spending & Saving Tracker report released earlier this year. Are you ready to provide a safe haven for your client’s pets? During the economic downturn, Americans perfected the “staycation” that kept the family pet at home. This pent-up demand for hitting the road and the air can spell opportunity for professionals who board pets. The first step is reminding your clients you are available and have space. This is also a good opportunity to update your pricing to current standards. Look at your overnight packages, especially the week-plus stays. Consider adding value to the stay with perks, such as a bath or nail trim. An early-booking discount can help you plan. Some email advisors suggest putting the information into a text-only email to prevent spam blockers. Others indicate your clients have given you permission to email, so a PDF attachment should get through and be more helpful. When your email is ready, send at a time of day you know most of your clients will have time to consider the information. For some, that is the evening. Others will choose a Saturday or Sunday morning. Be prepared to answer questions about the email both by phone and email. If there are several staff members, hand out sheets with basic facts about the promotion and how to book stays. Pet owners frequently use the Internet to research options. A Humane Society article on choosing a boarding facility is a good resource for pet owners and will help you be prepared for the kinds of questions you might receive. Think like a hotel, and offer to email out a confirmation with reservation dates and any information the pet owner will need to provide. List formats are helpful to pet owners, so consider the “box” check list. Try to track your success. Even a simple tally sheet near the main phone can give you good data. What do you do if you have more demand than space? Be happy! This means the great service you have given your clients during the economic downturn has converted into goodwill for your business. 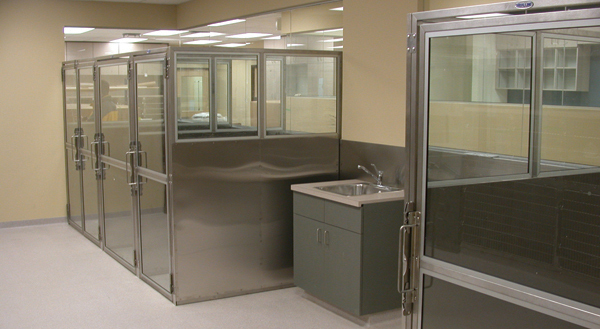 Our Shor-Line team manufactures a line of high-quality, stainless steel cage banks that can wheel into a boarding area and then store when demand is lower. 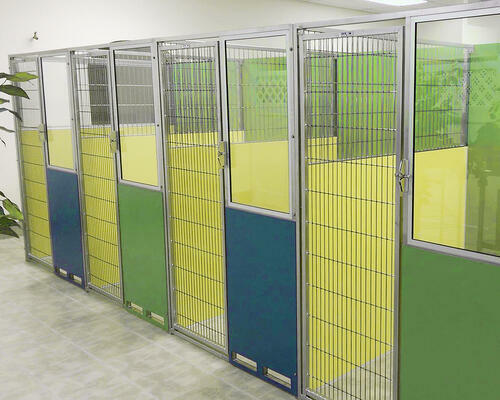 These cage banks also make great “rest areas” between play times at doggie daycares or in veterinary facilities with training or play areas. If you do decide to increase your capacity, don’t forget that your customers are depending on the same great service for their pet that they’ve come to expect. Be sure you allow time to give pets love and attention in addition to regular walks and feeding. Besides, making pets feel loved is why most people get into the business!! How pets leave your facility makes a lasting impression on whether the pet owner will board there again. No matter how busy your facility is, make sure the pets go home in the same condition (or better!) than they came in. Consider what simple handouts or information you can provide. You can take ideas from human daycares. Pet owners love to read about THEIR pet, so maybe a short report and a picture of their pet having fun. Little touches and happy pets reinforce the positive decision to leave a pet in your care. Make this the best summer for the pets in your care. 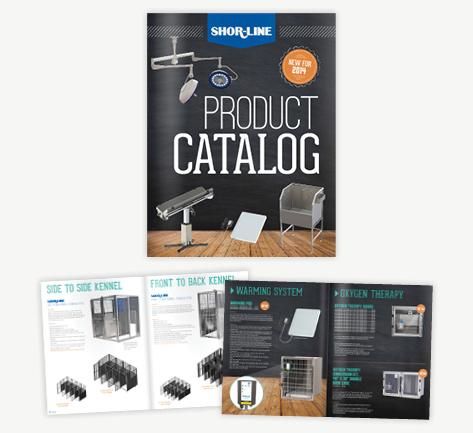 The 2014 Product Catalog Has Arrived! 2014 is off with a bang with the unveiling of 10 brand new products from Shor-Line. That's right, 10 new products! One of our most innovative is the Prelude Series LED Surgery Light. These LED lights have three different mounting options and feature a light that has a high intensity, proper color and a large field of illumination to ease eye fatigue. They are cool to work under and will not dry the surgery site. Other new products for 2014 include Squeeze Restraints, Corner Guards, Kick Plates, Continuum V-Top and Flat Top Surgery Tables, the Utility Table, Warming Systems, Oxygen Therapy products and the Small Animal Bathing Tub. Be sure to look for the orange New Product emblems throughout the catalog. Click the link below to view online or call 800-444-1579 to request a printed copy. Choosing the right design elements can help your team members do their jobs better—and faster. If you could change anything in your current veterinary facility, what changes would help you perform your job more easily? Once you pose this question to every team member, you’ll have the information you need to build or renovate a facility that supports efficient work habits throughout the hospital. Use the following ideas to help jumpstart your efforts. 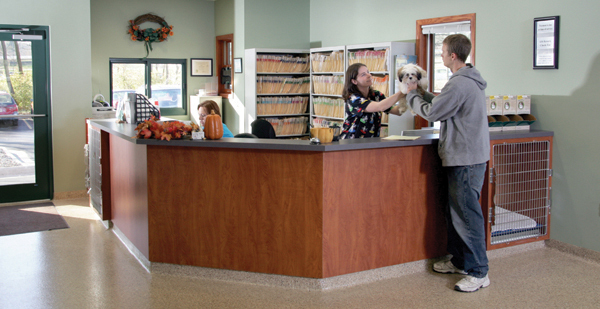 For receptionists to work efficiently, they need a front desk area that can accommodate multiple owners and their pets, says Stephen J. Kramer, a San Antonio-based architect with extensive experience in veterinary hospital design. That means ample counter space and, better yet, separate check-in and checkout areas. Some clinics build a separate telephone station so one person can man the phones while another person can attend to clients without interruption. Another way to increase efficiency up front is by making communication with team members in the back easier. You can accomplish this with a practicewide telephone system, overhead paging, and a design that provides easier access to the treatment area. Technicians and veterinarians perform most of their jobs in exam rooms and treatment rooms. To encourage efficiency in exam rooms, many new clinic owners equip these rooms with telephones, computers, and even desks. This allows doctors and technicians to access patient files and communicate with other team members without leaving the room. If square footage is an issue, the exam pod concept—a new trend in veterinary hospital design—groups exam rooms around a central area. Each room has one door that opens into this area. Equipment that serves dual purposes also increases efficiency. One example: a lift-table with a built-in scale. 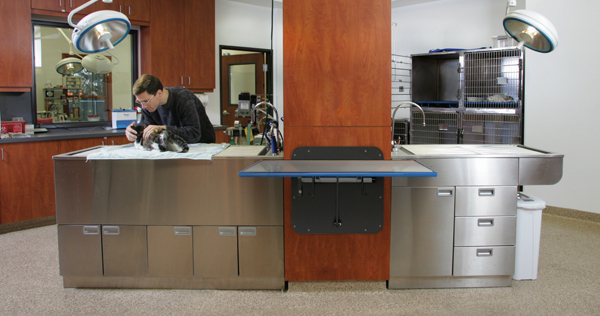 At Magrane Pet Animal Hospital, every exam room features a drop-leaf, foldup, or mobile lift table. Such options accommodate different patients with ease and speed. Technicians and veterinarians also spend a considerable amount of time in the surgery suite. To work efficiently, Kramer says ample space is essential. “The space should accommodate anesthesia or specialty equipment (e.g., ultrasound) and provide enough room so everyone can move around easily,” he says. Pass-through windows between prep and surgery areas also save time and, therefore, improve efficiency. Capitalizing on the time-saving aspect of pass-through windows, some clinics install these windows in laboratories and pharmacies toallow access to other areas, such as treatment and reception. When it comes to boarding and grooming areas, one word is synonymous with efficiency: cleanliness. The easier it is for team members to keep these areas clean, the more time they’ll have to attend to animals’ needs. What design elements facilitate easy cleanup? Wall and floor coverings are two important ones. In addition, Kramer says his firm likes to incorporate trench drains that can be flushed automatically. He also recommends a central, in-wall vacuum system, which makes cleaning even more efficient because it can be used throughout the entire hospital. Boarding and grooming personnel can also work more easily, quickly, and safely if the clinic provides a step-up tub for larger dogs. These ideas are only the beginning. When you sit down with staff members to gather their input, develop a list of design elements that meet your specific needs. The criterion is quite simple: Any feature that makes it easier for you and your team members to do your jobs better means more efficiency—and that makes a great case for including that feature in your new hospital. Kennel Run System Hardware - Protect It! Kennel Runs are an important part of a successful veterinary or animal care enterprise, but kennel runs are only as good as their installation. An installation is only as good as the installers and the hardware they use to do it. This post focuses on issues related to kennel run hardware. Quality kennel run products will come complete with the specialized hardware necessary to install them properly. This includes high-quality stainless steel barrel nuts & screws, face plates, trim, latch bars & brackets and customized connectors for whichever type of installation your job requires. As soon as possible upon delivery of your order, make sure all hardware is labeled, received, and accounted for. Some hardware may have been manufactured specifically for your job therefore it is very important to account for all hardware as soon as possible. Contact your provider immediately if there are any questions or problems. Segregate your hardware from surrounding construction activities and keep hardware together. Protect it. 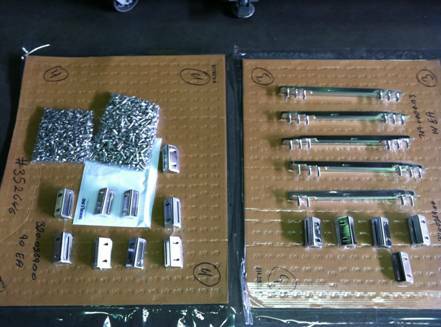 Bulk fastener hardware (i.e., barrel nuts and screws) will likely include an extra 10% or so over what is required. For all other hardware it is more likely that the exact amount will be provided (although there may be an extra piece or two for some items). Refer to your installation manual and only take and use the hardware needed for each run, room, or area you are working in – do not move it in bulk to each area. This helps prevent hardware from getting lost, misplaced, and/or scattered throughout the job site and becoming difficult to account for later on. In the unlikely event of a shortage in your hardware, your provider should supply the remainder needed to finish the job. If for some reason however you wind up needing ‘extra’ hardware, you will likely be charged for it and the shipping of it. If next day air is requested, you will likely incur those charges as well. Following the guidelines above will help you stay on track and complete your construction project in a timely manner. 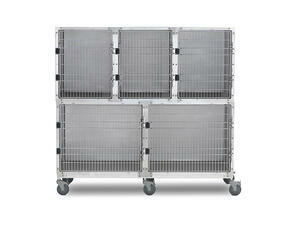 This will be a much more individual purchase than it is for many of the other items in your veterinary hospital. You don’t just open a catalog and select from a couple of options like you would for a table, tub, or scale. While all kennel gates and panels are made to standard design parameters they are configured to meet your individual needs. It is important to remember that the building is part of the Kennel Run design. Things like wall construction, window and door locations, drainage and floor slopes are all part of your kennel considerations. For most people this is a long-term investment. Cutting corners on the design and construction now will most likely result in higher costs for maintenance and repairs later. Good drainage and airflow along with a well-lighted kennel will provide a safe, comfortable environment for both the client and the staff. It is also important to choose materials that do not absorb water or harbor bacteria. 1. We will require a sketch or drawing of your new or existing Kennel Run area. It should include room size measurements along with door, window, and drain locations. It is also helpful to know the planned use of kennels (i.e.,: boarding, hospital patient, Icu and recovery, etc.). this will assist with selecting the best options. 3. Get a quote based on the number of Kennel Runs and configuration with the options you have chosen. 4. You will receive drawings for approval. These will illustrate the options you have chosen, show how they are installed and indicate the sizes and space requirements for your installation. This is a critical step in the process. Your kennels will be manufactured per these drawings. Also, the correct hardware needed for a successful installation will be determined from these drawings. 5. Once we have approved drawings your order can be finalized. This is also when all credit terms must be agreed upon and any down payments applied. 6. The lead time for your order is determined on an individual basis. We make every attempt to meet your schedule. However, things like current shop capacity, other items on your order, the size of your order and amount of custom work required all affect your lead time. Once your order is complete you must be prepared to receive your shipment. Your order will be shipped to you by truck line. Your components will be on pallets that can be moved both in our warehouse and by the shipper by forklift. Depending on the size and type of gates and panels you have ordered each piece may weigh 50 – 100 lbs. Unless other arrangements have been made it will be your responsibility to unload the truck and bring the gates and panels into your facility. Knowing what to expect, and the steps involved, should help the process go smoothly and alleviate at least some of the stresses involved with a project of this type. As always, feel free to call us at 800.444.1579 at any time during your order with any questions or concerns. We are happy to help.